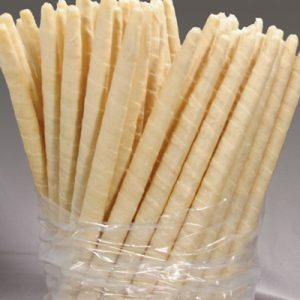 Pure and Healthy Beeswax Pillar Candles at affordable prices. At Bee Healthy, we are all about purity and clarity of ingredients. You will find the best handcrafted candles in all shapes and sizes but that’s not the only advantages we offer you. With our wide-ranging assortment of hypnotic candles, you will definitely find what you are looking for. 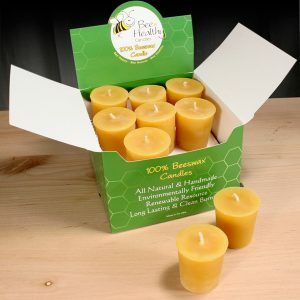 Our Beeswax Pillar Candles are handcrafted with 100% beeswax that’s lightly filtered and retains the natural aroma of honey. 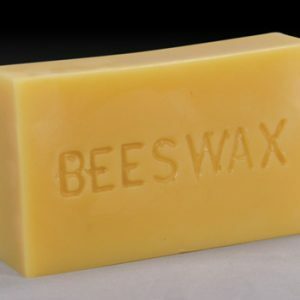 We add zero allergens or fragrance and ensure a consistency of beeswax that lets out no soot, no smoke. Do you have trouble burning paraffin or aromatic candles indoors? As candlemakers who have been handcrafting specialty candles for decades now, we are not surprised to hear that at all. A lot of people worry about darkening or ruining their designer roof or cabinets because of the soot that paraffin candles give out. This is why, we have designed what you need: A soot and smokeless, golden-hued candle that will burn all night with no annoying aroma. 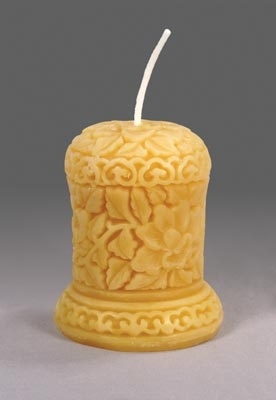 Our round pillar candle is a natural gold candle that comes in 4.5″ x 2″ size. Perfect for a cozy friends’ get together at home or an impromptu candle-light dinner or the sophisticated and romantic late night bathtub escapades, our beeswax pillar candles’ aroma leave behind the real fragrance of honey with zero additives.